Are you Android phone user? 20 Secret codes that every Android-smartphone user should know. Android is one of the most popular operating system for smart phones ever. Android operating system is the most widely used in the world. In the world of smartphones, Android-based phones are widely used worldwide mobile phone. Android users are increasing day by day in the smartphone. Developers have created a different kind of backdoor in the range of applications and operating systems. Android Developers also creates a lot of backdoor, through which you can log in and you can change the settings. 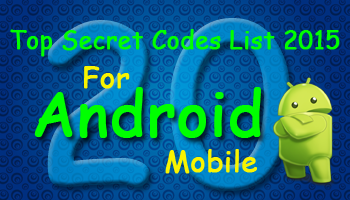 I give you a list of android secret code, which is very useful for you. Android, the operating system is very easy to learn for non technical persons. These all Android code applicable to any smartphone of any brand such as Samsung, Motorola, HTC, Micromax, Karbon, Lava, Panasonic, Huawei, etc. Opens file copy screen where you can backup your media files like images, videos and audios. There so many code like that. I am only share 20 most important secret codes.